It was on a dark, rainy wintry night in Stoke that Kath Evans realised the drawbacks of having to dismantle a scooter in order to get it into her car. "We'd just been shopping and I was in the car while my husband, Keith, was taking the scooter apart because it was too heavy to lift in otherwise," she said. "It's not an easy job and it can take a while, but it was only when we got home that we realised we'd forgotten to put the battery into the car. "That kind of thing is easily done. It was dark and the battery was black, sitting on Tarmac. Of course it had gone by the time we got back to the car park - it was an expensive lesson!" 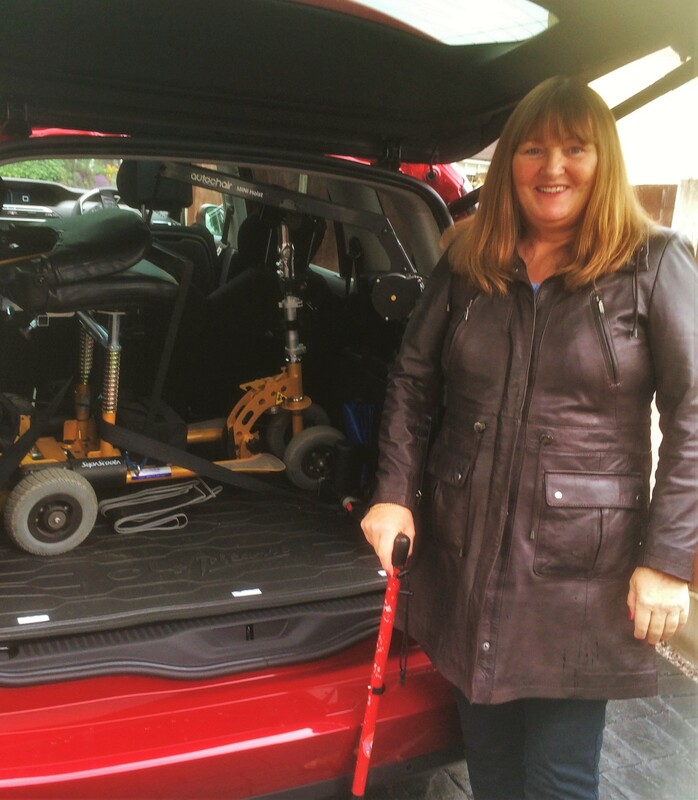 For the past 20 years Kath, a Motability customer, has had psoriatic arthritis, which has badly affected her spine and means that she cannot walk very far. Unhappy with the idea of using a wheelchair – not least because it would mean Keith would have to assist her everywhere she goes – she owns a SupaScoota HD-02 which, at 27kg, makes it difficult for her to lift into a car alone. It has meant that her independence was curtailed, but then, during a visit to the Motability Show last year, the couple arrived at Autochair's stand and found out about our 80kg Mini-Hoist. Designed to be fixed at the side of a car boot, mini-hoists are operated by the touch of a button and can lift scooters cleanly up into the air, where they can be guided into the boot, all in the matter of seconds. Not only did this mean that the couple would no longer need to dismantle Kath's scooter in dark wintry car parks, it also meant that she could get out and about herself, giving her freedom back. And so, in April this year, one of our fitters, Richard, travelled to the couple's nearest Evans Halshaw car dealership and fitted the 80kg Mini Hoist into their brand new Citroen Grand Picasso. Kath said: "Richard was brilliant. He had never seen a scooter like mine before and I think it wasn't easy to fit the mini-hoist to accommodate it, but he managed it beautifully. "The hoist is wonderful. It is so easy to operate and it means that I can go out by myself without having to rely on Keith or, as at other times, my daughter to come and help me, which was always really frustrating". "That feeling of independence is fabulous."